Than a bacon sandwich- the ultimate downfall of vegetarians!. 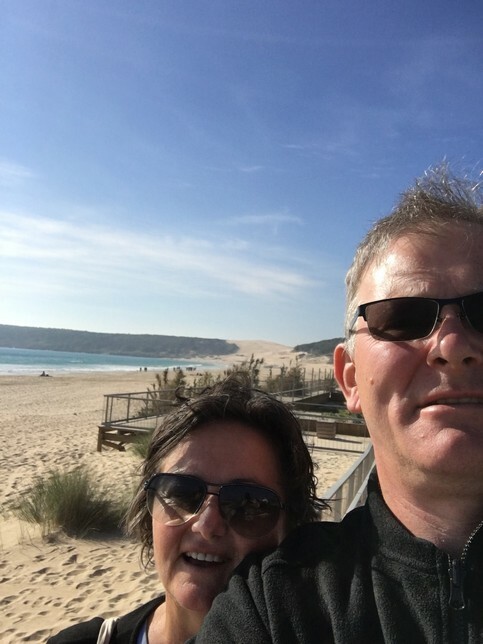 Wed 27/1/16: We revisited Zahara de los Atunes again essentially so D could test Dolly Drone again in the wide openness of the beach and what a wonderfully glorious day it was, sun was beating down on us as we revisited the restaurant we had been to on the previous Sunday. Wasn’t actually our intention to go back, but there weren’t that many places open and this restaurant has a wonderful beach/sea location and the couple running it really do ‘work’ the passing potential clientele. The food was again very good and we both had fish each as the main course, the star of the day was the shrimp tortilla though. 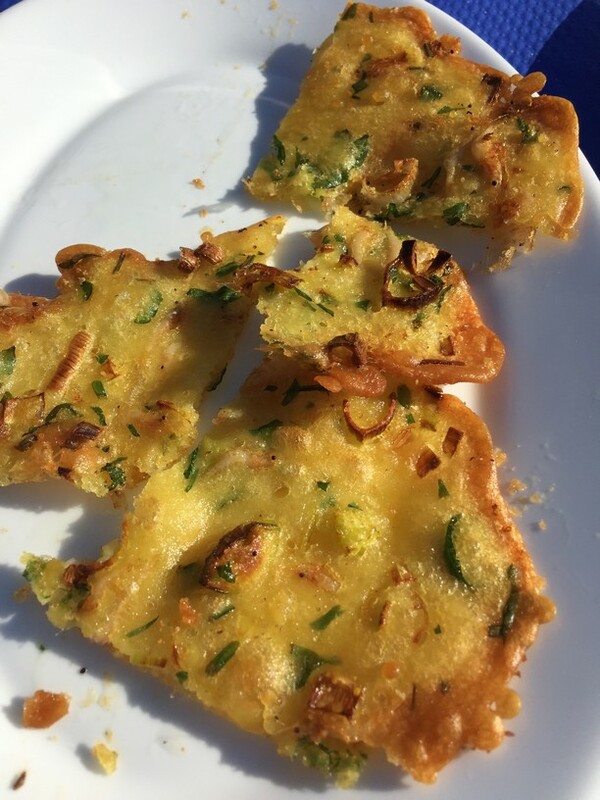 We had them in Cadiz and another place and to be honest not overly bothered, bit like giant sized crisps, but these weren’t- they were moist and had some content to them, really quite spectacular. Thurs 28/1/16: A golf day after school and very pleasant indeed and as ever the locals were very friendly. David being invited out with 3 local Spanish players and he didn’t disgrace himself!. We couldn’t make up our minds what to do for food that day and thought we might actually eat in the golf club but nice as it was there weren’t many people in there and so the dinner there went out and so we headed back to our good old faithful bar Manolo’s for tapa and they didn’t disappoint. The outstanding one for me was the tuna and onions- the tuna was in chunks and looked like pork almost, really tasty along with meatballs and pork. As ever we were treated well there and got in addition to dinner some black pudding and chorizo for us to taste. We even had a little dance with the barman, fortunately he didn’t realise just how bad D’s dancing is and we didn’t progress any further on that. Fri 29/1/16: Pick of the day homemade chicken curry!! Even though we had a lovely tapa lunch with a school colleague Danka and they were lovely tapas slightly different to norm as bigger- I had fish and David and Danka had the chicken. 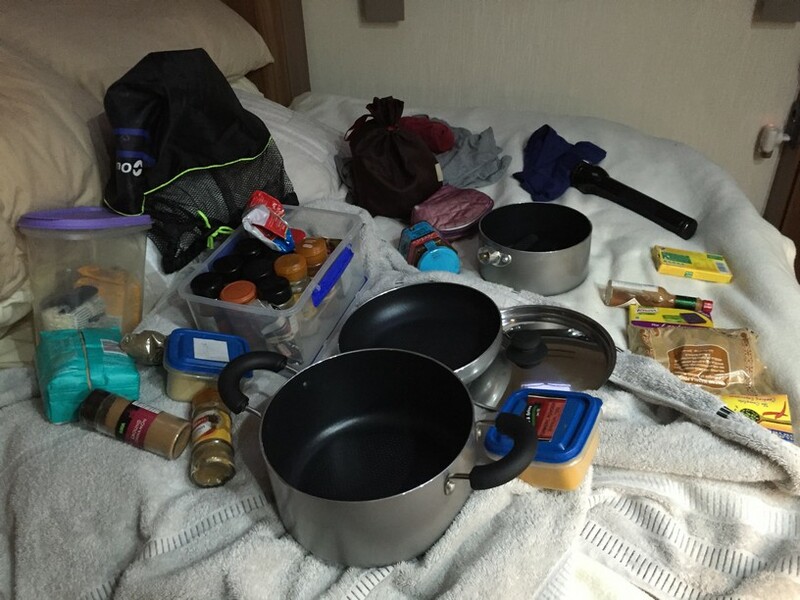 But we decided that we would after a whole week of saying shall we have…… chicken curry we did and brought the chicken pieces and some spinach in the local Lidl . 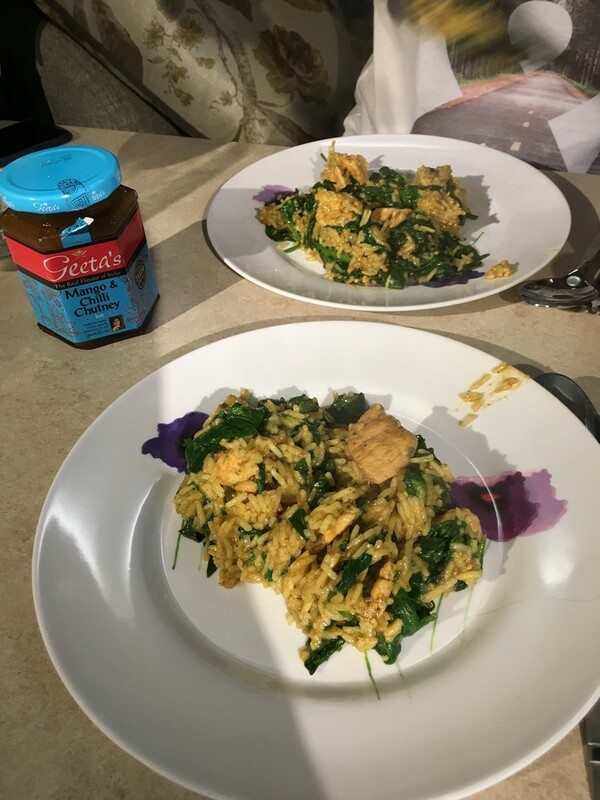 Normally we use Pataks curry paste which we didn’t bring a jar of with us but we did bring a lot of spices and so we made up a curry paste with them and fried off the chicken and then using a stock we cooked rice and then added spinach right at the last minute- worked very well indeed! Sat 30/1/16: And what could be finer than a bacon sandwich the bacon brought locally and although streaky back was very good, the let down was the bread and that was a let down on my part as the rolls were frozen and I over cooked them and so were slightly crispy but still just lovely to have a bacon sandwich with Daddies sauce. everyone’s list, but we found a café like place that was very busy and had a lovely Jack Russel that was intent on chasing all 2 wheel vehicles and then decided we might be his lunch option as well- bad choice, no freebies coming from our table. We ordered from the menu and then saw some croquettes arrive at the next table- uhm, with a bit of pointing we discovered they were the day’s specialities and so added them to our lunch. Would we have ordered them ordinarily No as half of them were squid black ink but amazing and No we wouldn’t have picked that, the other half were prawn based croquettes-all absolutely tasty. I made a mistake in thinking I had ordered a soup to start which turned out to be tomatoes and thinly chopped onions in a dressing but the tomatoes were so sweet it was not a mistake I regretted. So Bolonia or not??? After lunch we headed onto the beach and the dunes I could then see why this place is so rated. Not pretty in a quaint Cornish seaside town way but just stunning as a vast open wilderness with sand dunes, vast sea scapes and mountains hemming it all in- Yes up there as a place to go. Put it on your list for sure. Oh, your blog sounds so yummy! What about your Spanish course? Are you happy with it? Blimey! Your blogs are prolific! How do you get time to do anything else!! Oddly enough we don’t think so have written the next one already. It’s funny writing a blog really makes you think about what you are doing, so time well spent. David what have I told you about dancing with bar men? Learn some control! Otherwise a fascinating insight into surviving on a tight budget in Spain. I did not proof read the post all lies you know I can’t dance.